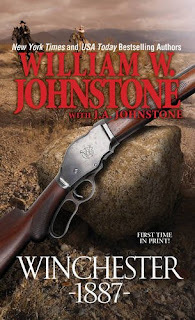 The story of the Winchester continues with the family named James Mann and the rifle given to him by his uncle which we read about in the previous novel Winchester 1886. Here we see the young man called Jimmy leave during the night with his Winchester and the badge his uncle bequeathed to him in his pocket. Now, in the light of day, his father sets out to bring him home after becoming aware of Jimmy’s absence. What he father encounters reveals his past before he got married and settled down. All Jimmy wants to do is to be like his uncle James and become a law man. From the moment he leaves his home danger lurks around every corner. Jimmy, though single-minded, is definitely a green horn which is quite evident when he hops a train and runs smack dab into trouble! From here on out the adventure begins, but so does the danger when Jimmy unknowingly hooks up with a whiskey runner in the Indian Territory! In the era where life caused children to grow up very quickly and life being precarious is a characteristic of the old west. I so enjoyed following the Mann family, learning about their life experiences and the how duty-bound Jimmy felt to follow in his uncle’s ways. Another aspect of the book that I liked was the passing down of knowledge of how to live on the frontier and how to be a lawman. I highly recommend both Winchester 1886 and Winchester 1887. If possible, read them consecutively as the tales will bring hours of enjoyment! Keep on riding toward the setting sun partners!